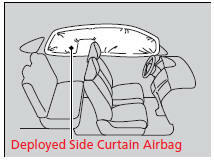 The side curtain airbag is designed to deploy in a moderate-to-severe side impact. One or both side curtain airbags may inflate in a moderate to severe angled frontal collision. In this case, the side curtain airbags will deploy slightly after the front airbags. The side curtain airbags are most effective when an occupant is wearing their seat belt properly and sitting upright, well back in their seat. Do not attach any objects to the side windows or roof pillars as they can interfere with the proper operation of the side curtain airbags.